If you've been watching the news, you may believe the U.S. Social Security funding crisis won't hit until 2034. 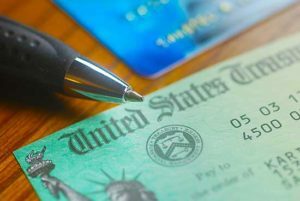 Starting this year, payments to recipients will exceed the total income received by the Social Security Administration (SSA) by $25.4 billion. The report says SSA expects the shortfalls to continue "every year during the 75-year projection period." The reason people aren't making a big deal out of this is because we have the $2.8 trillion Social Security Trust Fund to fall back on. That money is projected to cover the annual deficits until 2034. The Social Security Trust Fund is not an account with $2.8 trillion in it. It's a stack of IOUs sitting in a filing cabinet in Parkersburg, W.Va. It's nothing but debt. Technically those IOUs are U.S. Treasuries, but this particular flavor of Treasury cannot be sold or traded in the bond markets. It can only be redeemed by the U.S. government – which needs to pay for it with money from the General Fund. The federal government has three options to pay for something: new or increased taxes, cuts elsewhere in the budget, or borrowing. It's as if the Social Security Trust Fund never existed. A Congress required to make up the shortfall in the SSA budget would have the exact same three options for funding it. There's no practical difference. The Social Security funding crisis is now, my friends. If you're looking for scapegoats, U.S. President Ronald Reagan tops the list. He was behind the Social Security Amendments of 1983, which implemented changes supposed to shore up the program for decades to come. Among the moves Congress made were making benefits taxable for wealthier beneficiaries, requiring the self-employed to pay the full tax rather than just the employee's portion, and speeding up already-planned payroll tax increases. The changes were a great success, generating $2.8 trillion of surplus revenue for the Social Security Trust Fund in the decades since. But instead of setting this money aside, the Reagan administration decided to funnel it into the General Fund of the federal budget and issue bonds – those IOUs I mentioned earlier – to the Trust Fund. Successive administrations, both Republican and Democrat, followed suit. Over the years, the money intended to fortify Social Security for the wave of retiring baby boomers that started in 2007 was instead used to pay for tax cuts, wars, and an assortment of wasteful government expenses.Successive administrations, both Republican and Democrat, followed suit. The problem will just keep getting worse as the size of the deficit accelerates. 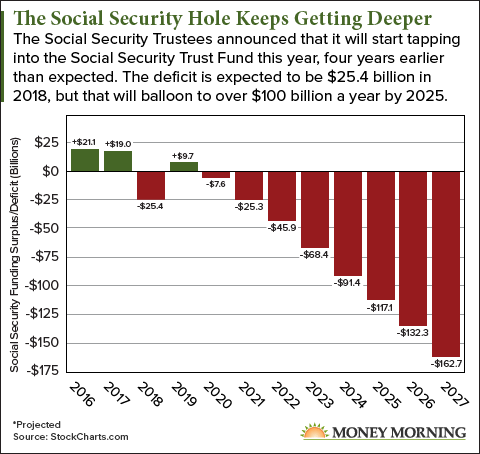 The Social Security trustees expect a $25.4 billion shortfall for 2018, but the program's annual deficit will exceed $100 billion by 2025. By 2030, the annual deficit will be in the $200 billion range. Congress is well aware that money is long gone (it spent it, after all) and knows it will need to take some sort of action in the next few years. Congress can't afford to wait until 2034, when the Social Security Trust Fund will, ahem, "run out." Lawmakers uniformly fear tampering with Social Security because so many people – one out of six Americans – depend on it. And these folks, for the most part senior citizens, vote at higher rates than other age groups. Social Security's reputation for being the "third rail" of U.S. politics is well deserved. But just about any action Washington takes will have implications not just for those receiving Social Security befits, but for all Americans. Eventually, the full retirement age will have to be raised to 99 years old and all the problem is solved for the government. I want my $21,344. Now! Today, 75-year-olds on average will live just as many additional years as the average 65-year-old did in 1952.